– RPM measurement for automotive engines with 2 to 10 Cylinders using the inductive Pick-up. 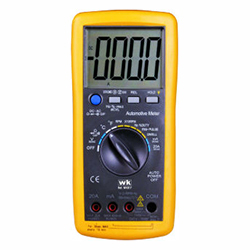 – 13 Functions including DCV, ACV, DCA, ACA, Resistance, RPM (Tach), Dwell angle, Duty cycle, Frequency, Temperature (ºC/ºF), Capacitance, Continuity and Diode Check. – Read pulse duty cycle and dwell angle for electronic fuel injection feedback carburetors, and ignition. – WK017 MeasuresMilliseconds pulse width to test on-time of fuel injectors, idle air control motors, and electronic transmission controls.